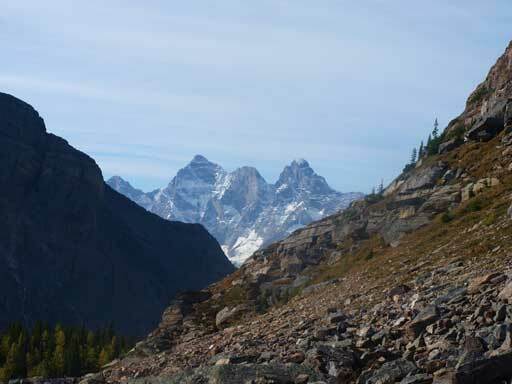 After bagging the Chester Lake trio – Mt. Galatea, Gusty Peak and The Fortress the day before I was still highly motivated. The weather was still looking good and I still had lots of energy to kill. Unfortunately I couldn’t find a partner so a solo trip was in the order. 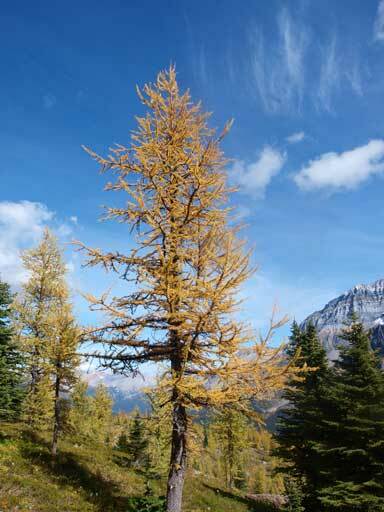 It’s mid September and time to fully take advantage of the larch season. The best time would be the next weekend, but I couldn’t rely on it due to the uncertainty in weather. It took me a while to decide my objective, as there were simply too many possibilities. 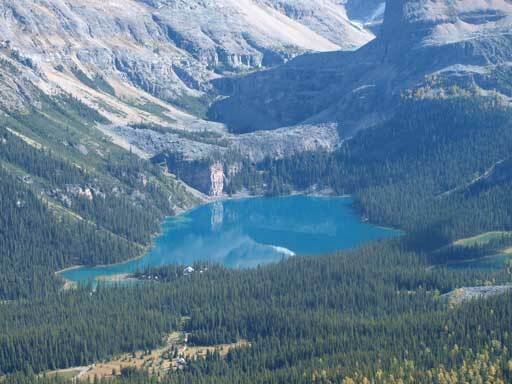 Eventually I decided on the unofficially named “Little Odaray” in Lake O’Hara area so at 11 pm I found myself driving northwards into Yoho. 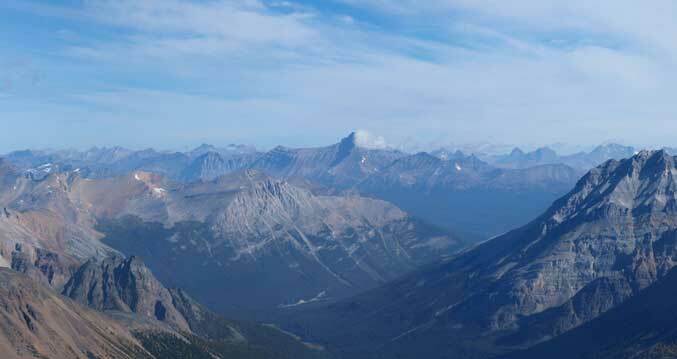 This is a mere bump along the south-east ridge of Odaray Mountain but does offer some unique views. 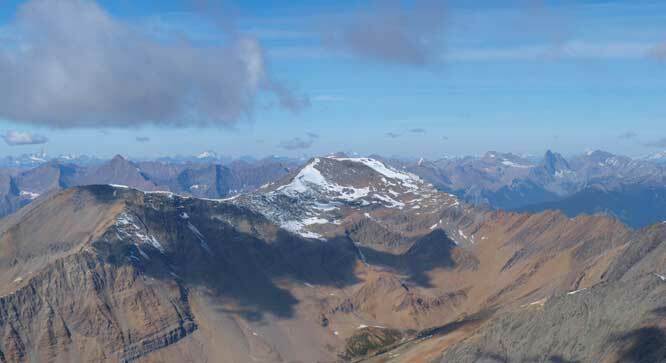 The traverse to Odaray Mountain would require technical climbing negotiating an exposed notch and that’s way out of my league at this point. I decided to do a 8am start. However, by the time I got ready, I was surprised that there were several cancellations so I could take the bus in… Wow! That saved me a lot of time and energy, and I decided to increase my ambition to both Little Odaray and Mt. Schaffer. The best 15 bucks spent ever! The bus dumped all of us at Lake O’Hara lodge. It felt really good to have a starting elevation of 2000 meters. Everything was pretty much in shade at 9 am, so I didn’t bother to take photos of the lake. 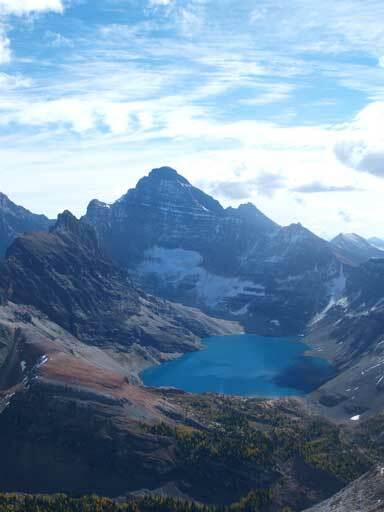 For picturing Lake O’Hara, afternoon sun is much better than morning sun. This rule applies for pretty much every lake and impressive peak in this area. 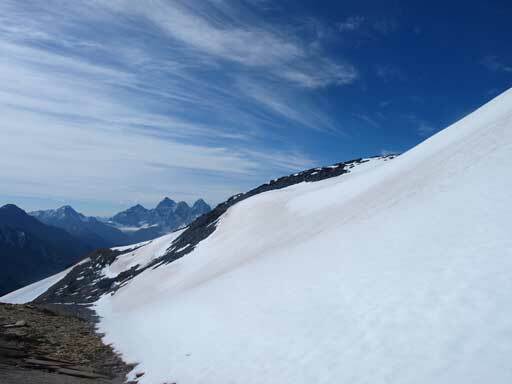 The approach is one of the most well-maintained I’ve ever done and in no time I arrived at the Elizabeth Parker Hut. 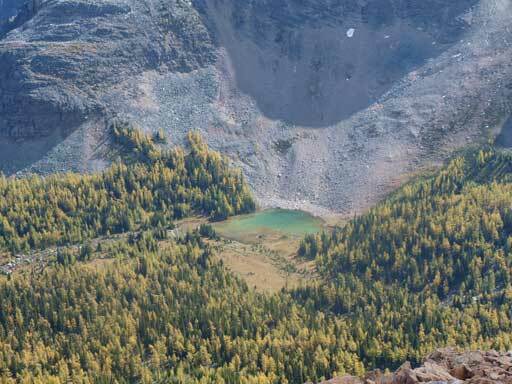 The trail goes into the forest again, but with a fast walking pace, it didn’t take me long to reach Schaffer Lake. Again, everything was in shade at this time, so I didn’t bother to take photos. 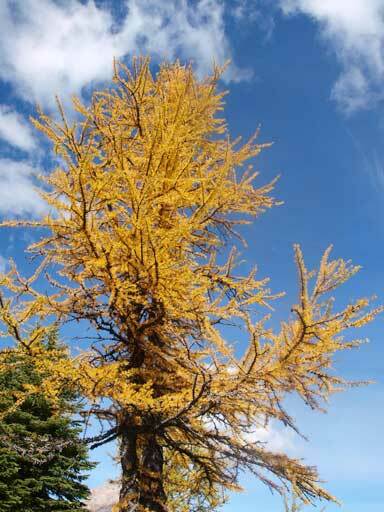 I could see most of the larches were turning yellow. This’s gonna be gorgeous in the afternoon. I was surprised to see a group restriction on Odaray Highline trail… It only allowed 2 parties per day during the summer time… Nobody signed the log ahead of me so I continued on. After breaking through the forest, the trail followed the treeline and traversed horizontally towards climber’s right side. 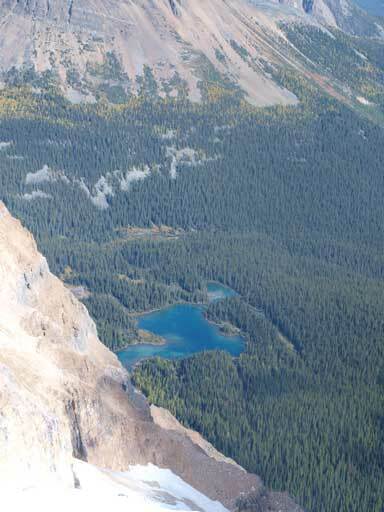 The view towards Lake O’Hara side fully opened up, but again, the morning sun was very bad for taking photos. I got much better photos on the way down. 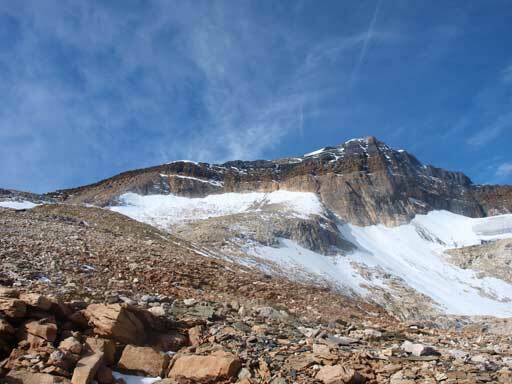 The trail turned sharply left and starts to ascend the slope straight up. 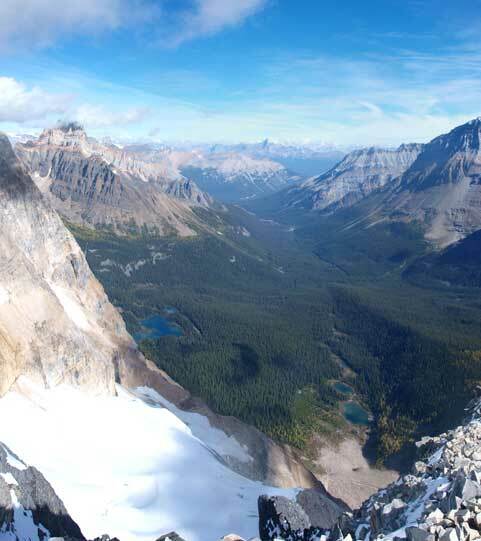 By following it I broke through the first cliff band through a weakness, and topped out on a plateau. I think this is the official end of Odaray Highline trail. There’s some good view of Odaray Mountain and its glaciers. 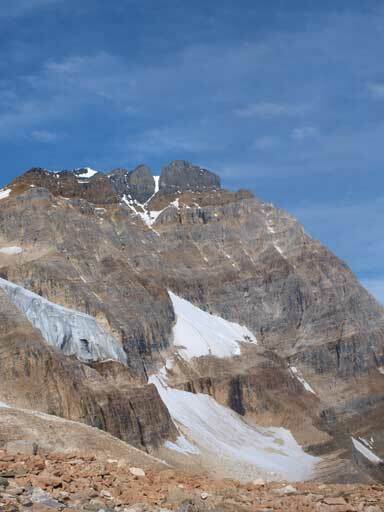 From here on, the terrain became “easy to moderate” scrambling. 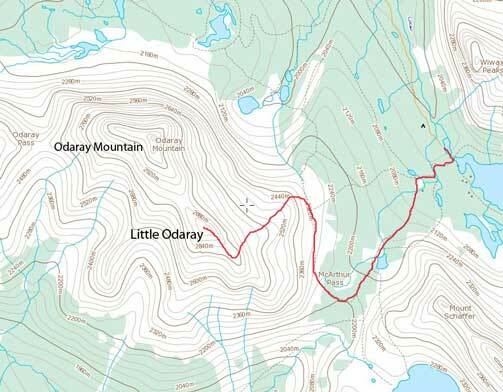 Little Odaray is not a walk-up, and you’d better come here with some experience on steep terrain.. 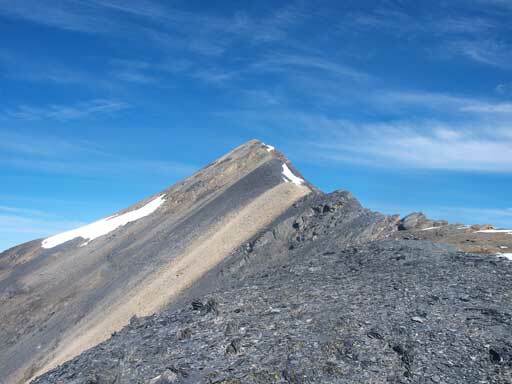 I managed to catch up a solo hiker on the upper slope, and he didn’t even make to the summit ridge due to the steepness. However, route-finding was easy thank to the abundance of paths and cairns. 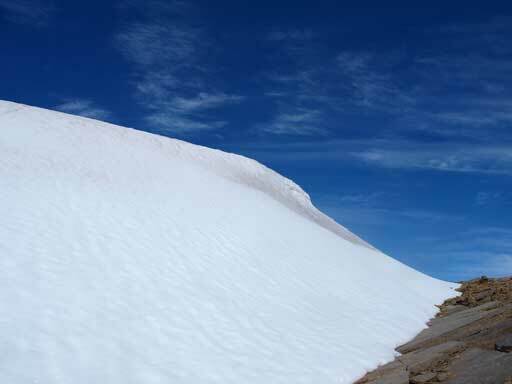 Once at the summit ridge, I was blocked by a huge ice snow scoop… I tried to ascend the snow, but my hiking boots couldn’t do any kicking in, and I was forced to skirt around on climber’s left side. Skirting around involves a bit of elevation loss but manageable. Looking towards Odaray Mountain. There is a huge notch making this traverse not being a scramble. Looking down the shear east side. The approach road comes up from this way. 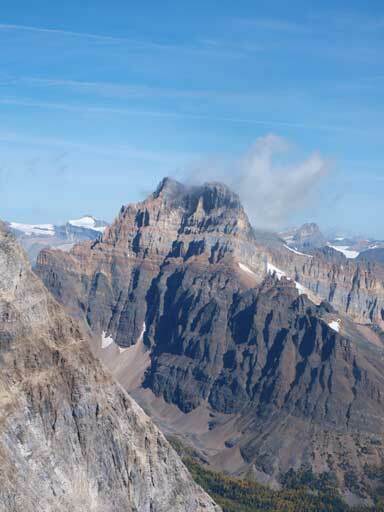 Mount Vaux rises behind Mount Owen. Both of them are scrambles. 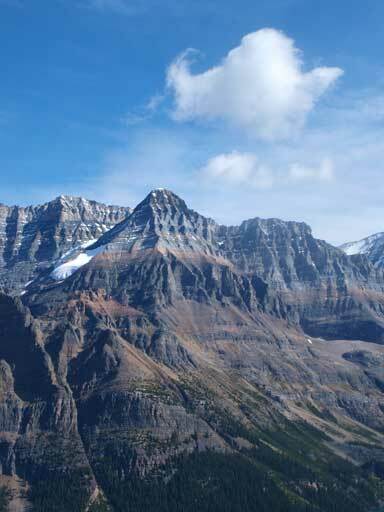 Park Mountain is the peak in foreground. 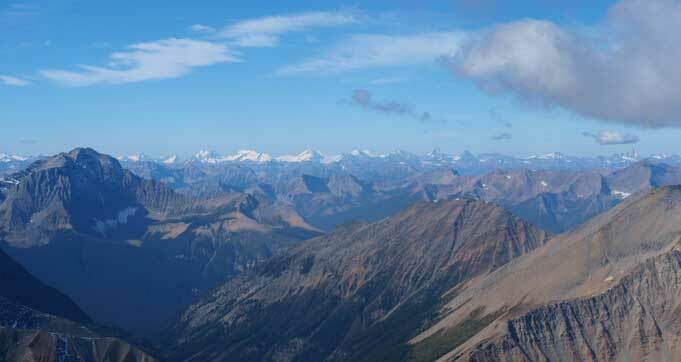 Mount Hector in the distance. I took a long stay on this summit hoping to get some better photos of the Lake O’Hara area, but the sun direction changed very slowly. I couldn’t wait forever so I decided to descend. 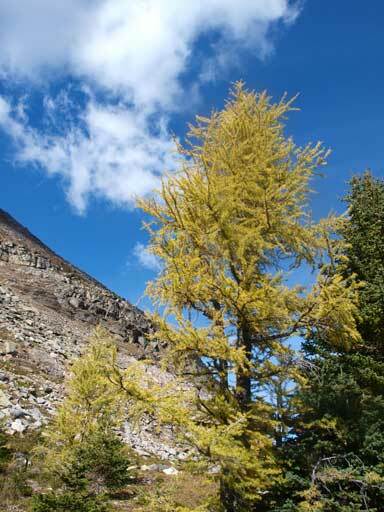 I did manage to get some good shots near treeline and I took my time shooting the larches on the way down Opabin Plateau Trail. 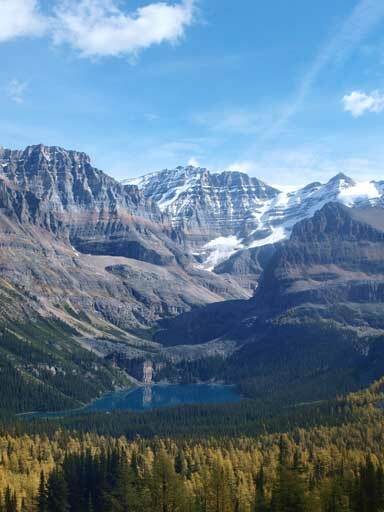 Panorama of Lake O’Hara Area, one of the most beautiful areas in the Rockies. 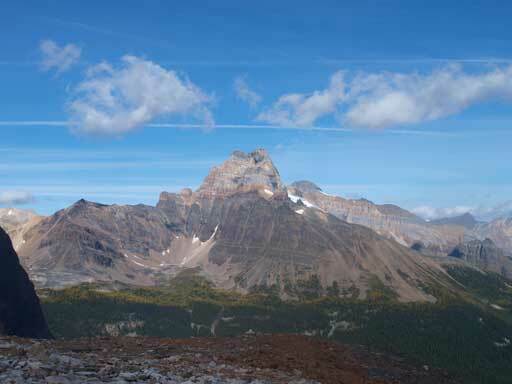 Soon enough I rejoined the Lake McArthur trail and my next objective would be Mount Schaffer! Love this TR and pics! 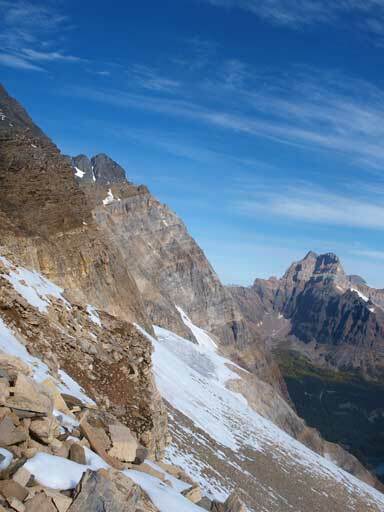 I’m heading there late June, and was wondering how long it took you to do Little Odaray and then how long it took to Mt Schaffer…would doing both in the same day be a great option? If only one, which one? 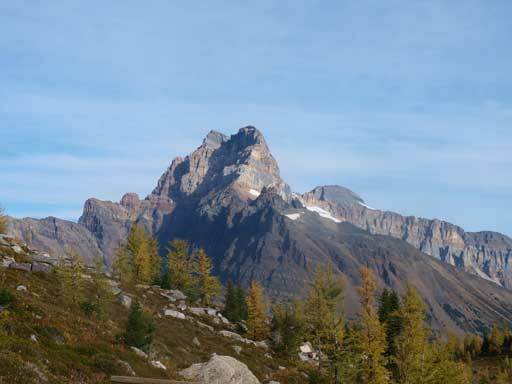 We’ll be doing the Lake O’hara Apline Circuit the day before and will be staying at the campground. Also sorry for commenting 4 years after the post hahaha hope it’s still relevant! Hey Jocob, I kinda don’t remember how long exactly, but I did catch the first bus in, bagged both and then caught up the second-to-last (4:30 pm) bus out, but I was by myself and went fairly efficiently. If you only do one, then do Mt. Schaffer (more scenic and more view of the lakes). That area is always worth coming back for.